Zoe Memes began as a simple funny gesture from me to my youngest daughter about her rotten poodle, Zoe. I was struck with the confident composure of this tiny critter sitting on my couch. Then I picked up momentum realizing how much fun memes can be, so I started cranking them out. I did 100 Zoe Memes in 100 days summer of 2016. During that time, I came to the realization that the word Zoe means “life” in Greek. I know little zip zip Zoe poodle dog won’t be around forever, but joy in the human heart will. I began to ask myself, what all could bring joy, bring life to the human heart? I am going to begin branching out with Zoe Meme’s to include differing aspects of life that bring joy. I will no longer limit it to the human’s pets, although they will still take a prominent place in Zoe Memes. Meet Charleigh Mae, my great niece. Isn’t she a cutie-pie? She has the most amazing family. Her mom sends pictures of this busy girl to family and posts things on the face-place social media regularly. It is easy to see why. We could nearly make a series on the adventures of Charleigh Mae. Valentines of 2017, Charleigh Mae’s mom asked her what she wanted to create for Valentines day. She said, a monster bag! And that is exactly what led to this picture. CM was giving a huge RAR! for this picture moment. I wish we could all have such abandonment with joy to such simple things of life. Maybe we just did with this Zoe Meme! 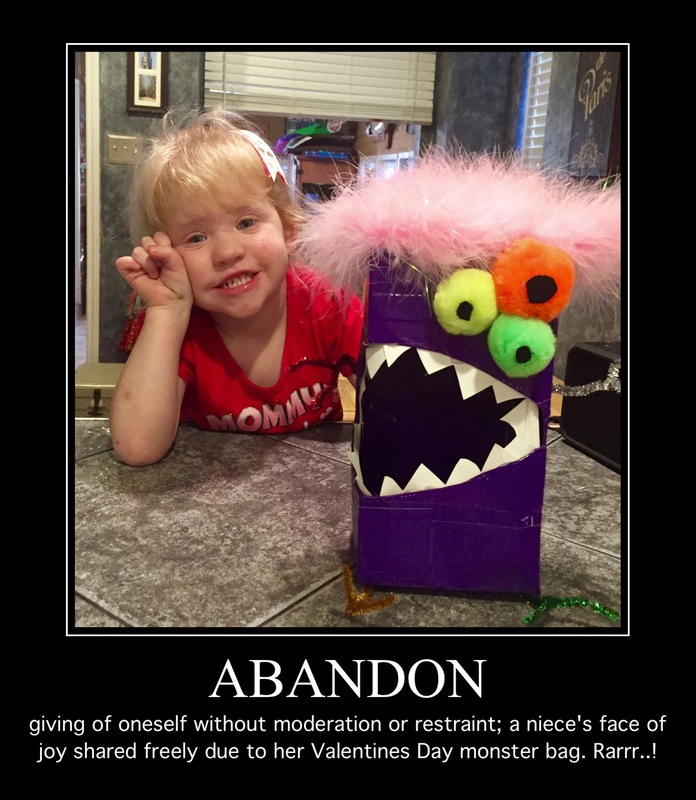 This entry was posted in expression, humor, joy, love, Meme, monster, Uncategorized, valentines, Zoe and tagged abandon, dog, greek, life, PET. Bookmark the permalink.